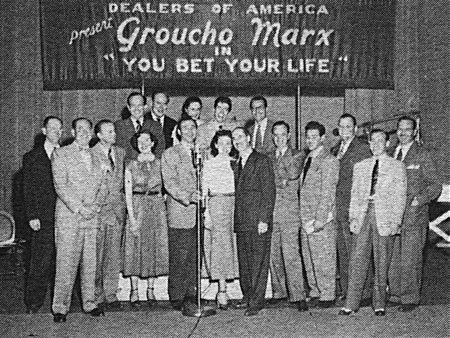 Groucho and his "partners in crime during the third season on CBS radio:" First row, Edwart T. Tyler, Gummo Marx, Bernie Smith, unidentified, John Guedel, Dorothy Nye, Groucho himself, Robert Dwan, Hy Freedman, Carroll Nye, the CBS sound effects man, the CBS unit manager; second row, Edwin I. Mills, sound engineer John Neal, unidentified, Jerry Fielding, George Fenneman. that gets you breezin' You got a better reason. And then You Bet Your Life it's love.